Updates about Bardor Tulku Rinpoche can be seen on the Kunzang Palchen Ling web site. To purchase Ven. Bardor Tulku's cd Liberation Through Hearing: For the Benefit of Animals. 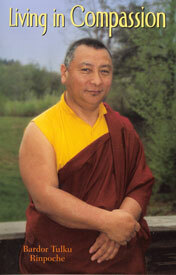 Bardor Tulku Rinpoche was born in Kham, East Tibet in the spring of 1950, and is the Third Barway Dorje Tulku. He was recognized as tulku (incarnate) by HH. the 16th Gyalwa Karmapa while still small, and fled the persecutions in Tibet in the company of his family and some others when he was just 9 years old. He was the only member of his family to survive the journey and then the oppressive heat of the Indian lowlands. Under the tutelage of the Karmapa, he received his education and training at Rumtek Monastery in Sikkim. He attended the 16th Karmapa on his world tours in 1974 and 1976, and in 1977 His Holiness asked him to remain in New York state at Karma Triyana Dharmachakra. There, according to His Holiness' wishes, he actively participated in the construction of the magnificent shrine building is there. Read more biographical details below. Venerable Barway Dorje Chaktrul (Bardor Tulku) Rinpoche was one of three trustees at KTD appointed by the 16th Karmapa Rigpe Dorje, where he served in that capacity from 1977 - 2008. In the 1990s he was one of two officiants (the other was Native American,) to bless Winston Farm in preparation for the concert known as Woodstock '94. In 2010, after more than 20 years of service as Treasurer at KTD as Treasurer he is devoting himself to Kunzang Palchen Ling, which was founded by him in 2006 on a 5-acre plot of land donated at Red Hook, New York. There he welcomes new and former students with assistance from resident lama, Lama Sangye, who is also Bardor Rinpoche's attendant. Rinpoche is a married man and the father of three daughters. His gracious wife, Sonam Chotso, is an accomplished practitioner and a lama in her own right. She is the patron of a nunnery in Sholda, Nangchen where, in the summer of 2007, Sonam Khandro reported that there were 100 nuns; 13 of them doing the 3+year retreat. Bardor Tulku Rinpoche is tireless in his attention to his students, to the Teachings and to the particular aspects of the lineage of the Barway Dorje Tulkus. He is unfailing in devotion to the flourishing of His Holiness' activity, both in America and around the world. Nyupchen Sangyé Yeshé, one of Guru Rinpoche's 25 close disciples, was an early incarnation of Bardor Rinpoche. Later, legend relates, how when King Langdarma attempted to destroy Buddhism in Tibet, mahasiddha Nyubchen Sangyé Yeshé terrified him by making the tarjini mudra or "scorpion gesture," which resulted in a monstrous apparition of the creature appearing above the king's head. 19th-century terton, Jikme Chokyi Senge was the 9th incarnation of Nyupchen Sangye Senge, and he was also a terton (hidden-treasure-finder.) Terma are considered teachings hidden by Guru Padmasambhava (9th century CE) expressly for the benefit of future generations. As such, they are associated with Nyingma (Old School) denomination. Jikme Chokyi Senge became known as the First Bardor Rinpoche when he discovered a terma (hidden teaching) known as the Barway Dorje (Blazing Vajra.) The name, Bardor, is a contraction of the 2 words. Later, the First Bardor Rinpoche (Jikme Chokyi Senge) established Raktrulgon Monastery in Kham, East Tibet. Künzang Rinpoche, a tulku (incarnation) of Jikme Chokyi Senge's second son, and Karma Thupten, a doctor who was the Second Bardor's attendant, recompiled the Barway Dorje texts after they had suffered destruction at Raktulgon during the Cultural Revolution of the 1960s. "Dechen Barway Dorje was one of several treasure revealers active at the end of the nineteenth century and the beginning of the twentieth. A disciple of the ninth Tai Situ Rinpoche, of Chokgyur Dechen Lingpa, and of others, Barway Dorje was initially associated with Surmang Monastery. He went on to revive the lost teachings of the Barom Kagyu, and to reveal nine volumes of treasure teachings concealed by Guru Rinpoche, Yeshe Tsogyal, and Nupchen Sangye Yeshe. He was also the reincarnation of both Yeshe Tsogyal and Sangye Yeshe. Toward the end of his life he founded Raktrul Monastery, which is active to this day and has affiliated centers in the United States." The Second Barway Dorje [scroll down the link to see detail of portrait] was born in Kham, East Tibet, with the family name of Yi Mar Pon Tshang. He spent his early years at Situ Rinpoche's Palpung Monastery. Later, he served for many years as the Appointment Secretary to the Sixteenth Karmapa at Tsurphu Monastery. Because the monks at Ratrulgon Monastery sought Bardor Rinpoche's help so insistently, Karmapa gave him permission to return there for one year. Once there, his duties were of such proportion that his stay subsequently lasted several years. Truly regretting this delay, the Second Bardor Rinpoche prostrated along the entire journey back to Tsurphu. He then remained in the service of His Holiness for some time, only again to be summoned by the monks of Raktrul. This time, while he was there, the King of Nangchen petitioned him to perform many rites and rituals. Consequently, with this second journey which occurred during a very turbulent period, the Second Bardor Tulku did not live to see His Holiness Karmapa again. The current Bardor Tulku Rinpoche (b. 1950) was recognized while still a small boy by the Sixteenth Gyalwa Karmapa. After the recognition, he continued to live the transhumance lifestyle with his family but accompanied by his Dharma tutor. They were constantly on the move in the search for pasture to graze the yaks and dris. When Rinpoche was still a little boy, the family left East Tibet on a journey that took them first to Lhasa and then on to Tsurphu. From there, they travelled to Drikung where they stayed at the home of his grandparents for some years. Then, as the Chinese Communist occupation of Tibet took hold and political and social conditions worsened, Bardor Rinpoche's family, then a party of thirteen, set out towards India along with many other Tibetans also fleeing the fighting that was spreading southwards from Lhasa. They traveled through the Kongpo region and then traversed the Himalayas having to negotiate 17,000- foot high passes before descending into the steamy jungles of Assam, India. While in Pemakor near Assam, when Bardor Rinpoche was barely nine years old, and as happened with many other Tibetan refugees, one after another of his family died as their bodies failed to adjust to the tropical climate. When his father, the very last member of his family, died, Rinpoche set out with a twelve-year old friend and a group of other Tibetans who had also fled their homeland. At Bomdilla, the township where the borders of Tibet, Bhutan and Assam meet, a bombing raid dispersed the group. Rinpoche and his friend managed to flee the attack, walking continuously for a day and a half. The two friends traveled westward along the border of Bhutan and India through Gohat and Siliguri to Darjeeling. There, His Holiness the Sixteenth Karmapa was notified that Rinpoche had safely managed to make his way out of Tibet. Filled with joy at the news, His Holiness arranged for Rinpoche to be brought to Sikkim, and for Rinpoche's friend also to be taken care of. There, at Rumtek Monastery in Sikkim, under the tutelage of His Holiness Karmapa, Bardor Rinpoche's formal training as a tulku began, and it was there that he was subsequently officially enthroned. After completing many years of study and practice, Bardor Tulku Rinpoche accompanied the Sixteenth Karmapa on his world tours in 1974 and 1976. Then, in 1977 His Holiness asked Rinpoche to remain in New York at Karma Triyana Dharmachakra. During his first two years there, he worked side-by-side with the staff to renovate and winterize the Mead house and prepare for what was to be the last visit to the West of the Sixteenth Karmapa. In 1980, during that last visit, His Holiness directed that His monastery and Seat in North America be established at Karma Triyana Dharmachakra, and he performed the formal investiture. In 1981, His Holiness instructed H.E. Gyaltsab Rinpoche to arrange to conduct the groundbreaking ceremony. The ceremony took place in May of 1982, after which Bardor Rinpoche directed the construction plans and activities, and labored each day to help build the monastery. In 1983 and 1984, Rinpoche visited Taiwan and Hong Kong where he taught the Dharma and was enthusiastically received by hundreds of students and practitioners there. During the years 1985 through 1987, Rinpoche spent many months in Nepal supervising the construction of Karma Triyana Dharmachakra's statues and ornaments: the imposing Buddha rupa, the emblem that is the Wheel set between a pair of deer, the Gengura [alt. sp. gingara] spire for the top of the monastery, and the Sixteen Arhats for the library shrine. Bardor Tulku returned from Nepal in 1988 with Tinley Chojor (d. 2008 aged 72, just weeks before the visit of the 17th Gyalwang Karmapa) who masterfully rendered the traditional decorative painting of the monastery. In 1989, Rinpoche was joined in the USA by his wife, Sonam Chotso and daughter, Karma Sonam Wangmo. The following January, on the concluding evening of a seminar on the Twenty-one Taras and just shortly after having given the Green Tara Empowerment, Rinpoche took his wife to a local hospital where his second daughter, Karma Chimey Chodron, was born. Within two years, his third daughter, Rigzin Chodron was born. It happened that the 2nd Bardor Tulku aspired to manifest in two incarnations, perhaps so that Raktrul in Tibet would not be abandoned. In 1998, they had a momentous meeting. Rinpoche goes to Raktul to meet the resident Bardor Tulku. Bardor Tulku Rinpoche continued to teach at KTD in Woodstock, NY, in conjunction with its esteemed abbot, Khenpo Karthar Rinpoche, until 2010. Milarepa's life according to Bardor Tulku, Dec. 1992. Di dang ten du ge way shi pa tsol. Ka nyam dro way pal du bar jur chik. Meaning, May the 3 Jewels bestow good forever. May this heir to the Karma Kagyu firmly remain to uphold the Dharma by the vast blessing power of the 3 Roots and the truth of my aspiration. And may this Sun of the Dagpo Kagyu teachings blaze at full power for the glory of all throughout infinite space. On Friday evening, 36 people attended Bardor Tulku's arrival at Rigpe Dorje's latest Centre [on Decarie] where he was welcomed by one of the founding members, who reminded us that this was the 4th time he had come to a new milieu of ours. Rinpoche responded that there were generally two types of people, the sedentary and the nomadic, but "still I encourage you to find a permanent place* where you can enjoy meeting regularly, where the dharma will flourish." The subtle reproach was greeted by laughter, an expression of nervousness rather than mirth. *As of July 2007 Rigpe Dorje Centre has its own building at 503, 5th Avenue in Verdun. Rinpoche reminded us of the importance of cultivating bodhicitta ("enlightened mind," ie. compassionate attitude) at the beginning of any session. "The goal is to benefit limitless sentient beings -- as vast as the sky," and to listen in a receptive manner. We began with the invocation to Dorje Chang, and later, concluded by dedicating the merit, as we did at each of the sessions. The introduction to Taranatha's (ca. 1575) condensed Prajnaparamita known as The Heart Sutra was tantalizingly brief. The Tibetan was rendered into English by Chojor Radha, who with Rinpoche is also on the faculty of KTD. Chojor is a refined scholarly man who is knowledgeable in several languages including some Sanskrit. He has a pronounced Nepali accent which sometimes tricked my less-than-acute hearing, but Tibetan is his native tongue. This, and his familiarity with several different English renditions of the fundamental text made him the ideal translator for this, essential, teaching. An eminent teacher in his own right, may he continue to accompany Rinpoche on his rounds. Montreal is fortunate to have Esther Rochon of Shambhala to smoothly and precisely render the English expression of dharma into French. Since it normally takes almost a third more time to render into French what was said in English, this is not always an easy task, and no doubt an interpreter can sometimes feel the pressure of time. However, those who are not fully bilingual can use this interval to try and "get" key words or dharma terms and use them to refresh their understanding. Mme. Rochon's clear translation, which is free from any editorial, allows one to fill in any gaps in comprehension, to record sophisticated idioms, and it occasionally allows time for reflection on the teachings. The text opens with the Sanskrit salute to the Buddha, Namo Buddhaye. [It is customary to dedicate one's work to one's teacher, without whom the work would not have been produced.] Bodh, the root of Shakyamuni the Teacher's title, means awake, but is usually rendered as enlightened. Rinpoche reminded us that in the context of the Mahayana bodh evokes two things: the bodhicitta aspiration and also preservation or persistence in that attitude. It is to those two ends that we cultivate the 6 paramitas of generosity, morality, tolerance or patience, diligence and concentration. "We hold that the nature of all phenomena is buddha-nature or tathagatagarbha [matrix of becoming.] This has 3 characteristics: 1. It is simple. That is, it is free of fabrication, 2. It is unchanging/unchangeable, and 3. It manifests in all aspects. Taranatha explained that this concentrated essence of the Prajnaparamita teachings is complete, omitting nothing. Why is tathagathagarbha considered to be the essence? It states that 1. There is no form ("no sound, smell, touch," etc.) 2. It is unborn, therfore 3. any [apparent] form is Empty. Rinpoche warned that all these no-s can lead to a misunderstanding -- that all there is then, is some kind of hollow darkness. That would be dangerous and a kind of nihilism. [Void is the usual English term for Sanskrit, shunyata. But consider zero, which is a kind of resting place or marker, rather than an indication of quantity.] Therefore we must understand it is a kind of luminosity-and-emptiness. And we are never without this buddha-nature. But if this is true, how come we are not enlightened? There are two perspectives -- the relative and the absolute nature of reality. These are not in opposition, for if we considered that they were, we would fall into what is termed Dualism. Someone who holds dualist or negative views may not believe in the law of cause-and-effect or karma." At that point Rinpoche said that he hoped this was just enough for us to become excited about the text and look forward to the next two days. There were slightly fewer people in attendance on Saturday morning, and I decided to avail myself of the comfort of one of the new padded office chairs available at the new site. Sadly, as for many of the older "Western" members, it may be that my days of hours of cushion-sitting are drawing to a close. Rinpoche again began by reminding us of the aspiration to benefit others, and reviewed the meaning of the title of the text. The teaching would proceed in 3 stages; topics to be covered would be 1. Establishing the authority of the text [as in good journalism] by stating who, what , when, etc. 2. A line -- or rather, stanza by stanza -- elucidation and 3. conclusion with appreciation. Tradition holds that the member of the Noble Sangha known as Vajrapani was often the one who recorded Buddha's words. Since that time, authenticity is traditionally demonstrated using the formula, "Thus have I heard." Taranatha does not omit the ancient introduction, saying that at Rajgriha, on the hill called Vulture's Peak, there was a large gathering that included a great number of monks and nuns (or, as Chojor Radha said, "Members of the Shilayana" [way of virtue -- those bound by vows] and other shravakas or "hearers," plus many bodhisattvas, buddhas [visible and not] and also gods, anti-gods and spirits. Vajrapani reported that the Master knew that the time was ripe for this great teaching -- and that the karma of those present had ripened to the point that they could benefit from it. He took care to record the event "without any error or additions." Chojor-la referred to "All properness of circumstances." That is, the time, place and timing were perfect, as well as the kinds of beings who were in attendance, and too, there were many witnesses. In those days, the Master would sometimes confer preliminary vows of renunciation to a person simply by writing to him or her, or he would adminster the vows of complete renunciation in person. He would "turn the wheel of dharma" in public teaching, or he could meditate and convey his meaning to one of his students who would then speak the words as if "by inspiration" and there would be full faith, trust and confidence in the teaching. In this instance, it is Avalokiteshvara who speaks, and Shariputra who then puts a question, but we should understand that in both instances it is actually the Buddha who is teaching via these two Noble Sangha members. How did the teaching begin? The Buddha was observed in samadhi -- deep meditation. Chojor-la said that there were two usual translations in English: "perceiving profundity" or "profound illumination" and "We prefer the former," he said. The Master was examining the skandhas [aggregates or heaps -- the bases or apparent components of phenomena] and perceived them as "empty of nature." The phrase indicates that he actually experienced this -- a thing which only happens in that state of meditation, which therefore is called samadhi [Skt. is-ness, that-holding or suchness.] Normally in meditation there is the time of meditation and then a post-meditative state, but the Buddha is always in samadhi. Perhaps due to the long intervals of translation, Rinpoche always took care to link one part of his discourse to the next. Bardor Tulku reiterated that the Buddha was always in samadhi, even though his students may have thought he was "resting in meditation." In fact, for that reason the Buddha is known as "Bhagavan Tathagata" [Lord Thus-gone.] Avalokiteshvara also meditated and observed and analyzed the 5 formations of name, form, and so on. In ordinary life, they are considered as impure, but they are also the source of the 5 Wisdoms. And they are inherently Empty. Listen to a recitation of the Sherab Nyingpo. 2. The meaning is given in two ways, a. in question and answer form, and b. by analysis. The question is posed by Shariputra who, speaking to Avalokiteshvara [while part of this great gathering of seen and unseen beings,] asks, "How should a person practice this Supreme Wisdom (Prajnaparamita?)" Remember that the Buddha in samadhi can inspire his students to ask and to answer. And Shariputra is a shravaka and does not normally have this inspiration, but here he does. So "Avalokiteshvara 'the bodhisattva mahasattva' says that all 'noble children' must follow this teaching by 1. studying it carefully while cultivating bodhicitta, 2. contemplating this teaching and eliminating any doubt [regarding it] and through 3. right conduct including [the practice of] meditation." Then follows a question and answer dialogue on how to proceed that falls into 6 topics. They are: 1. an introduction 2. the essence or nature of the path that leads to realization 3. the fruition or result 4. the benefit of the realization 5. a brief explanation of the condensed practice and 6. the mantra. 1. To apply the Prajnaparamita, the person must have applied the 10 "conducts of dharma" and the 6 perfections. This is in order to prepare for the practice. The 10 dharma conducts [or virtuous activities] are: i. copying scriptures ii. making offerings to revered enlightened beings iii. practicing generosity iv. listening to teachings v. memorizing the teachings of a 'spiritual friend' vi. reread the dharma to sharpen one's knowledge vii. teach others viii. regular daily practice ix. even if you are satisfied [with your understanding] contemplate the teachings, and x. apply this in meditation in accordance with the teachings. The 6 Perfections are: i. generosity ii. discipline iii. patience /tolerance iv. diligence v. samadhi [meditation practice] vi. knowledge. [Beings are subject to the 3 obscurations of "clinging" or attachment, of "hatred" or aversion, and "ignorance" or confusion.] The reason why we are in a state of confusion is due to clinging -- to what is real or true. We may think things are real, eternal, etc. This is due to our deluded state of mind. Therefore, meditation is the NATURAL state of mind -- free from any idea of subject and object. We would be free of any dualism if we knew that all phenomena are Empty. [Working back, detaching the 12 links or nidanas, we would truly see this] from the aggregates, through the sense organs and the senses and so on. This is the completion of topic 2. essence or nature of the Prajnaparamita. Now to apply it to the path. As the root text says, "Form is Emptiness ... . In the same way, ... ." This is applied with both relative and absolute truths. Form is first. For example, we all believe that [Bodies 'R Us] and that our body is concrete -- we feel that this [Form] IS existence. But if we carefully analyze, we would see the Emptiness of our body. "Now it is time to fill the empty form with food. Though the food itself is empty ... . " Rinpoche's levity was received with a relieved burst of laughter following Saturday morning's intense session, and we did not resume until well after 2 pm. Confusion /delusion is attendant on everything that is concrete, so we must take care not to fall into either of the two extreme views: that of nihilism or of eternalism. That is why "Form" is given first, but it is no different from dharmatah [Chojor Radha emphasizes the last syllable of this Sanskrit expression] or Wisdom, in this sense. Whatever we perceive on the ordinary level is no different from the ultimate level, and free from any fabrication. The aggregates [form, feeling, perception, formation and consciousness] are empty, but as seen in our deluded state they seem otherwise. [Here follows an ancient simile that perhaps could benefit from updating.] If a person suffers from jaundice, he or she may well see a pure white conch shell as being yellow. It is not yellow, of course. And anyway, white and yellow are not two separate conditions. Similarly, dharmata is ALWAYS present in ourselves -- in our form; the aggregates are not separate from dharmata. Given that form is not a separate aggregate, and that it is also not free from the dharmata, then that must be true for all five skandhas. Dharmata has no characteristics, therefore whatever you thought about it is not so, nevertheless it [seems to] share certain qualities. For example, you may say a vase has no characteristics but if so, then it follows that the table that supports it can have none either, and so Emptiness is true of all the other skandhas. What are called the "marks" -- the characteristics -- also do not exist. Our ordinary mind is not ready to comprehend that which is beyond all characteristics. Therefore we [rely upon] imputation. The ultimate level is often described as "beyond words." That is the true nature and inseparability of Emptiness and Form. Dharmata is beyond words, expression, and concept. At the ultimate level, no characteristics or names exist in dharmata; it is unborn and undying. But at the relative level, we perceive dying. This is due to our confused state. If Emptiness is beyond all characterization, then it is also beyond cessation. But in the ordinary view, dying is one of the "labeled marks" or "labeled factors." Impurity or Obscuration is very samsaric, and it is caused by the afflictive emotions which give rise to karma. In a sense, there is actually no such thing as suffering -- it is perceived due to the accumulation of karma. A state that is free from this is known as Nirvana. "If one thinks, 'I have purified the obscurations and obtained Enlightenment' then one is deluded since there is not anything to be purified -- it is Empty." From Mme. Rochon's French rendition: "Neither contamination nor obscuration exists because form and so on does not exist separate from dharmata." The feeling of Obtaining the Perfection of Enlightenment [Prajnaparamita] has no real existence either, but rises from a deluded state of mind. In the real world we have these ideas -- they are merely the result of dependant factors. The Thatness, or Suchness, or Dharmata, is not touched by the faults of samsara. Neither is Nirvana polluted by the kleshas or defilements. To decrease defilements does not occur in the ultimate level dharmata. It never occludes, and never decreases. We need to recognize this. That is merely the result of the "dependant factor" or "thoroughly established factor" and is connected to samsara. But Dharmata or Buddha Nature is beyond that. When Avalokiteshvara 'the bodhisattva mahasattva' says, "Therefore, Shariputra, all phenomena are empty ... ," he goes on to explain that ultimate nature is beyond 8 characteristics: 1. Although we may see form, this nature is without characteristics 2. It is unborn 3. It cannot die 4. It cannot be obscured or polluted 5. It is not in need of purification 6. It never decreases ("Our Tathagatagarbha nature does not decrease even when we are in the depths of suffering.") 7. It never increases (as in 'obtaining Nirvana) and 8. There is no 'path'; no 'growing' of Enlightenment. This answer by Chenresi to Shariputra is about and explains Essential Nature. In the first part, we have been shown the meaning, now in the second part we learn how to practice: "Therefore Shariputra, in Emptiness there is no Form ... ."
On Sunday morning, through the kind work of a member's spouse, we each received a copy of the root text as translated into English by the Nalanda Translation Committee. We then found ourselves at topic 5: Benefits of the Path. Those who experience Prajnaparamita "go beyond [the duality of non-meditation and the state of] meditation transcending fear and samsara. They have undone the error of confusion or mistaken conceptions. That is, the Mahayana practitioner who has transcended does not fall into the trap of samsara. Such a one aspires to achieve the 10 bhumis. He or she will experience what is called vajra samadhi. Then this "awareness" or, in Tibetan, cheupa-sems, is not separate from, and is in harmony with, the Dharmakaya. Associated with it is the mantra of Prajnaparamita or "the great insight." It is said that with it you can accomplish all activities -- you can "wish fulfill." It is beyond all phenomena or worlds and can overcome one's ensnarement in samsara. Mme. Rochon: "mantra de grande intuition." The term for this is Nirvana, which, according to Chojor Radha, can actually have the meaning of "absence of suffering." It makes one inseparable from the Dharmakaya, and can help establish others in Enlightenment. (One who aspires thus is a bodhisattva -- in Tibetan, changchub, which literally means "obtained purification or, realization.") It is unchangeable, unstained and infallible. Teyatha (Thus or, in this way:) Om. Gateh, gateh (gate means gone and is repeated, once for the relative and once for the absolute) Paragateh (para means beyond,) Parasamgateh (sam means completely, absolutely pure -- gone beyond experience,) Bodhi (meaning awakened to the Dharmata) and Swaha or Soha [as it is pronounced by Tibetans] means "so be it!" Or, as Chojor Radha said, "This makes it complete." Or as the translator called it, a "briefing." Via the 6 learnings [competencies? ], the 10 conducts and the 5 (or 6) Perfections, Transcendental Wisdom results. Do not forget that both the questions and the answers come, in fact, from the Buddha. Then, to cut through any doubt, the Buddha speaks his approval. There are 3 aspects to this part of the teaching. The shravakanas ["hearers," audience] only see him sitting in meditation, so they may have some doubts, maybe thinking that a lesser teacher is producing this. Therefore the Buddha praises the speakers to indicate his approval, the excellence of the discourse and to say, "It is exactly like that!" When the text mentions, "I rejoice ... " [or, "all the tathagatas will rejoice."] this is meant to eliminate any remaining doubt. And that the Buddha himself would practice in that way since the teaching is free from any error or deception, and further, that all bodhisattvas should do as was said. The conclusion says, "... gods, humans, ashuras, and gandharvas rejoiced ... ." If Avalokiteshvara and/or Shariputra had any uncertainties, they are dispelled with this confirmation from the spirits. For example, the former might have had doubts as to the extent or length of his discourse. Then when all beings heard the comments of excellence and doubt-dispelling they all rejoiced and "praised the Blessed One." Bardor Rinpoche suggested that Khenpo Tsultrim Gyatso was certainly the one to help with that. It may have surprised some to learn that this venerable Kagyupa best known for his devotional songs is considered the expert on vipashyana [analytical or Emptiness] meditation. In one of the small quiet rooms at the back of the new quarters, Rinpoche gave preliminary instructions to those about to officially embark on the Buddhist path. Tantric empowerments, even those of a universal nature rooted in the Sutrayana such as that of Sangye Menla, are not given without this basic transmission as "context is everything." We do not practice magic, you could say. Refuge is given at almost every gathering where there is qualified lama, yet somehow this was a particularly auspicious occasion. In fact, members of Karuna, of lama [Denis Thomas] Sherab's group and of the new group in our area established by Dzogchen Ponlop Rinpoche also brought students to Rinpoche for the ceremony, so at 3 pm the gathering in the bright, warm gallery room had swelled by at least 25 people. There were three children present. Ten or so people followed the example of Stephanie in the correct manner of doing traditional prostration to the representative of the Buddha, and then requested this first ordination by patiently waiting on one knee with palms pressed together. The Refuge ceremony is more than a mere symbolic step, since a person is actually asking to be admitted to the sangha. It is undertaking a commitment -- at least to avoid, where possible, any taking of life -- and the contractual nature of the relationship is indicated by one's having reached the age of reason having come freely to their decision. This is indicated by the response "I agree," (actually, "I am content;") in Tibetan, "Toh-la." The benefits having been explained earlier, after the third repetition and actual transmission of Refuge, the postulant says, "Thank you" or "Leh-so." Rinpoche then enjoined the new Buddhists to consult books on keeping the vows and on appreciation of Refuge and respect for the 3 Jewels, "since there was now so much readily available material." That remark alone was a further occasion for joy. The Medicine Buddha Sutra is another record of the Buddha's discourse attributed to Vajrapani. There was reference made to Changla, so I would think this is a teaching of Kashmiri origin. It is another occasion during which one of the Noble Bodhisattvas is inspired to ask questions. In this instance, it is the Great Bodhisattva Manjushri who inquires. Rinpoche pointed out that there were two bodhisattvas who were abbots by this name, a senior and a junior Manjushri. There are two principle forms of the practice. One is from the older, long version that comes down to us via the khenpos of King Songtsen Gampo of Tibet -- the Nyingmapa transmission. The other is Namchu Ninje Dorje's terma. The one we use combines the new and the old and is considered an Atiyoga (or second level) practice. We -- our bodies -- are composed of 4 elements which are interdependent. When they are in balance, it produces good health. The suffering we experience is a [function] of samsara, and any ill health is due to "negative karma" [this expression is a kind of shorthand that refers to the consequences we experience due to our afflictive emotions and the actions that result.] If we were to purify the afflictive emotions (Mme. Rochon: "deraciner nos obscurations") that are the poisons that lead to suffering, we would not experience sickness. The many benefits that would result from that include our own good health, and also both the attainment of ordinary siddhis and supreme siddhis -- skills that enable us to liberate others. To accomplish this, we must first transform impurity to purity. Then followed the description of the distilled healing practice in which Buddha Shakyamuni is visualized as the Healer, the light of a clear blue sky is the context, and the empowerment of body, speech and mind was "through" a single torma. The mantra, which was reviewed in detail after the transmission, was the shorter Medicine Buddha formula. This transmission, following as it did the Prajnaparamita, seemed to have a profoundly clarifying impact. If only we were able to stop time and maintain samadhi for more than a few minutes! NB: Where an editorial comment or interpolation appears, it is in smaller type enclosed in square brackets. Bardor Tulku Rinpoche's 52nd birthday was celebrated at KTD. He was teaching from the Tibetan text of The Life of Gampopa over the weekend with translation into English by Lama Yeshe Gyatso. The evening empowerment was that of Arapatsa Manjushri. ... ... ... ... ... ... ... ... ... . The afternoon's teaching was attended by around 40 people who were delighted to see Ven. Bardor Tulku looking so well and fit. We were present for the account of some incidents that, in Jampa Mackenzie Stewart's Life of Gampopa (Ithaca, NY: Snow Lion, 1995) appear in chapters 11, 13 and part of 14. The source for much of that book is The 100,000 Songs of Milarepa. Lama Yeshe's accurate, colloquial rendition of Rinpoche's reading of the text was often delightful. It restored authenticity and immediacy to the words of Milarepa that is often lost as a consequence of the elaborate lexicon at the disposal of a writer. Gampopa (1079-1153) was the Khampa physician who had studied with many great Kadampa geshes (learned teachers) before becoming the disciple of tantric yogi, Milarepa. Dagpo Lharje, as he is also known, is considered the founder of Kagyu denomination Tibetan Buddhism, and his Four Dharmas are fundamental to the understanding of Mahamudra. On arriving at Milarepa's cave, Gampopa had a marvelous dream that incorporated 24 luxurious and seemingly auspicious indicators. However, Mila warned his student that paying inordinate attention to dreams "is an entry way for Mara." Furthermore, "do not pay attention to what others may say, but cultivate devotion to the guru. Also, do not examine faults, nor tend to think in a negative way; nor should you think too much about the nature of the mind. Those preoccupations can lead to a root downfall." 1. Whenever thoughts of food arise, Enjoy the food of meditation. Realize that all delicious tastes are illusion. Experience whatever arises as the dharmakaya. 2. Whenever thoughts of [warm] clothing arise, Clothe yourself in the blissful heat of tummo. See fine and soft things as illusion. Experience whatever arises as the dharmakaya. 3. At times you may yearn for your native land. Whenever thoughts of homeland arise, See your true home as dharmata. Recognize all homelands as illusion. Experience whatever arises as the dharmakaya. 4. ... . Whenever thoughts of gems and money arise, Take the seven [noble] riches as your treasure ... .
5. ... . Enjoy self-existing wisdom as your companion. ... .
6. Sometimes you'll miss your guru. Whenever thoughts of the guru arise, Pray to him as inseparable from you, at your crown. Meditate on him at the center of your heart. Pray to him, never forgetting him. But recognize that even your guru is a dream-like illusion. "Stay free of pride ... . Cut the bonds of ... attachment. Abandon all worldly desires for this life. ... . Merge all teachings into one practice: always pray to me." "..., you should be full of mindfulness, like a tiny cautious sparrow or a wounded deer. Do not let yourself grow prideful over your discipline, lest you poison all the merit you have gained. Be kindly to every being and in harmony with all. Be peaceful, compassionate, patient, and live purely. " ["When you practice Mahamudra"] Do not be distracted by liturgical practice. Then Milarepa, having empowered his student by words, song and further empowered Dagpo Lharje as a vajra guru by the gesture of placing a foot on his disciple's crown. Then, having told him to return on the 14th day of the Horse month in the Hare year, he said [surprisingly,] " I have an unusually profound pith-instruction, but it is too precious to just give away." And then he embraced him and gave him leave to depart. When Gampopa had gone almost out of earshot, he heard his guru calling him. He turned to see him beckoning, and so he went all the long way back, re-crossing the bridge, to see what it was his guru wanted. Milarepa took him aside, telling him that he had decided to bestow upon him the preciously profound pith-instruction, after all. Then he led him to a spot behind a large rock. He turned around, bent over and lifted his garment to show Gampopa his thin, old behind all crisscrossed with bumps and scars, "with lumps like the hooves of an animal" -- the result of years of meditation seated without a cushion on the stony ground. "This is the sort of effort you need, not any other doctrine. This is the essence of my teaching. ... . ... And this is the most profound teaching in Buddhism: Practice!" "A vulture flew from here to central Tibet and landed on the peak of a great mountain. Then from all directions countless flocks of geese gathered, and then they dispersed in different directions, and each bird gathered 500 attendant geese until all the plains and valleys were filled with golden geese. This means that although I am a yogi, many of my followers will be monks. The physician-monk will carry on my lineage and so benefit innumerable beings." Gampopa too had a momentous dream. In it he cut off the head of his own son and then rolled the corpse down a hill. He understood this to mean that one should not obscure the true nature of mind with the stain of conceptualization. The reading of this incident was followed by another of the Master's advice songs emphasizing altruism. It also tells us that "experience and realization are one and the same." The refrain is "hold it tight." Bardor Rinpoche, in selecting this text, emphasizes the role played by the guru in guiding the student to realization. And Gampopa's guru, Jetsun Milarepa, emphasized to him that we must not lose sight of the Goal which can successfully be achieved by means of searching, finding, and then resting in, the natural Mind. In other words, by meditation. In hearing about Milarepa's teachings to Gampopa, we can clearly see the link between the Tibetan and the Chinese Ch'an and Japanese Zen schools of Buddhism. There was time for two questions. The second focused on the Araptsa Manjushri empowerment that would be given later, in the evening. Q: Since that empowerment is associated with a form of divination to predict outcomes (Tib. Mo) how are we to understand Milarepa's remark concerning such matters? A: There must be the pure intention to benefit beings and personal experience of dharmata. Also people thinking of interpreting outcomes via this deity practice should have a connection with this bodhisattva. They ought to have had a clear vision of orange Manjushri, or a heart connection to him. If not that, then at least the preparation and practice of his sadhana. We should remember that context and circumstances are very important. Also if there is [the "reader's" personal] hope or fear attached to the action of divination. That is like Milarepa's warning to Gampopa. Also we should beware, for if a dream comes true, it can colour our interpretation of it and contribute to further hopes and fears. The person doing the divination is required to be disinterested or the result will certainly be skewed. In Montreal, Ven. Bardor Tulku Rinpoche gave the Medicine Buddha empowerment and Teachings on the Bardo. On Fri., Aug. 10 at 7:30 p.m. Medicine Buddha Empowerment was given. An auspicious number of students took Refuge prior to that -- "There are no bad [dharma] names" -- and Rinpoche gave a brief but interesting teaching on the Three Things it is Good to Do and Three One Should Avoid. Sat. & Sun. Aug. 11 & 12th: Teachings on the Bardo [interval between death and rebirth.] Rinpoche did not focus on descriptive detail, but rather on the bardo experiences as a reflection of the body's own nature. He showed how it is possible to prepare one's mind so that as we undergo this transition of conscious we are fearlessly able to respond to the various states of being. Rinpoche especially stressed that what we experience is a function of our own physical and psychological natures. The lung for Sangye Menla practice was given on Sunday morning after Rinpoche reminded us that an empowerment is only one of three essential transmissions. Besides a lung, it is necessary to also have instructions on the history/meaning of the practice and how it is to be used. Dagpo Kagyu: name for the lineages descended from Dagpo Lharje, Gampopa (1079-1153).